After the success of her USA and Japan tours in 2018, Perth-based Brazilian singer-songwriter Juliana Areias, the “Bossa Nova Baby”, is back at the Ellington Jazz Club. Juliana invites you on a musical voyage to Bahia, the “bay of all rhythms”. On this journey you will discover the origins of many of Brazil’s most significant musical movements: Samba, Bossa-Nova, and Tropicalia, as well as the Afro-Bahia fusions of Samba-de-Roda, Capoeira, Afoxe, Samba-Reggae and Carnaval. In the late 90s Juliana Areias lived in Salvador, Bahia’s capital and also the first capital of Brazil. Salvador is the Brazil’s most African city, where colourful big drums are played in the streets and ladies still dress in the traditional African clothes made famous by the 1940s Hollywood star Carmen Miranda. The Bahia of all rhythms concert will feature magic songs about the heavenly beach of Itapuan, (where Juliana used to live and started her singing career); mythic creatures such as Yemanja, the Afro-Brazilian Goddess of the Sea; African slave cultural contributions and the happiness of the Carnaval of Bahia. Juliana Areias will perform iconic bossa and afro-sambas composed by Antonio Carlos Jobim, Vinicius de Moraes, Baden Powell and Ary Barroso – to delicious tunes from Bahian artists such as Joao Gilberto (creator of Bossa Nova), Dorival Caymmi, Assis Valente, Caetano Veloso, Gilberto Gil, Carlinhos Brown, Olodum, A Cor do Som, Novos Baianos, Roberto Mendes, Jorge Portugal and Raul Seixas as well as a few originals from Juliana’s internationally-acclaimed Bossa Nova Baby album. Juliana Areias has performed on major stages internationally including the Sydney Opera House, Ronnie Scott’s Jazz Club in London, the Green Room in New York, the Montreux Jazz Festival in Switzerland, the Auckland Festival in New Zealand and the legendary Beco das Garrafas in Rio de Janeiro. Carlos Miguel – Music critic and judge member of the Latin Grammy Award. Let’s face it. Perth is great! It is time to celebrate it! In between her USA and Japan tours, Juliana Areias is glad to be back home in Perth, Western Australia, celebrating the amazing original music and unique creative community of Perth. Renata Fantoches (4pm); Helen Townsend (4.45pm); Constanza Herrero (5.30pm); Belle Harvey & Band (6.15-6.45pm), Capoeira show (7-7.15pm); Juliana Areias (7.30-8pm – with Joshua de Silva – guitar and Rafael Souza – pandeiro); Randa And The Soul Kingdom (8.15pm-9pm), Brazilian DJ (9-10pm). “Perth’s great music scene gets together to support a genuine school dedicated to teach kids and adults the art of Capoeira, the Brazilian martial art which is more than a self defence fight, it is the expression of dance, music, culture and resistance created by our African slave ancestors which now is admired all around the world. My kids – now teenagers – were among the first children to learn Capoeira at this school and it is such a pleasure to see every year more people discovering and falling in love with it. Come this Sunday to experienceo a watercolour of sounds and how beautiful, fun and powerful Capoeira is. Facebook event : Brazil V Australia Capoeira Fundraiser Gig” – invites Juliana. Turn it up! Turn it on! 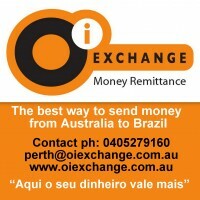 Perth 7-8pm // Sydney 9-10pm //Brasil 8-9h. Talking about this weekend shows with guitarist Mike Bevan coming from Adelaide to Perth after his Japan Tour to perform together at Cine Vivo ( Sat 12th) and at The Ellington Jazz Club ( Sun 13th). Tuesday 8/8 interview in Portuguese at Farofa WA Radio Show – 7-8pm Perth time. Listen online. Farofa WA YouYube Channel to listen later. Friday 11/8 – interview in English with Valentine at 6EBA World Radio – 9-10am Perth time. Listen online. SAT 12 AUGUST 2017 at CINE VIVO – Perth Latin American Film Festival. Juliana Areias & Mike Bevan (Perth – Brazil – Adelaide) – Double Tribute to Choro & Chico Buarque + Award Multiple winner Brazilian Movie Aquarius. Juliana Areias, the Bossa Nova Baby invites Mike Bevan – one of the best Australian guitarists, based in Adelaide – for this unique musical collaboration at The Ellington Jazz Club. Together with bassist Adam Springuetti, they will present an enchanting repertoire of cool jazz, summer sambas, breezy bossas and captivating choros – Brazil’s most sophisticated musical genre, the precursor of samba – authentically performed by Mike in a seven string guitar. It will also be a great opportunity to enjoy groovy improvisations and interesting originals such as “Estrela Acalanto” ( Star Lullaby) and “Garoto de Copacabana” ( The boy from Copacabana) co-composed by Juliana and Mike during one of Juliana’s trips to Adelaide. Perth based, Brazil born singer and song-writer Juliana Areias’s career includes performances at Montreux Jazz Festival, Sydney Opera House, Ronnie Scott’s of London and Auckland Festival. Her original album “Bossa Nova Baby” produced in Perth, has featured as the “Changing Face of Australian Music” on ABC Radio National and has been receiving multiple music award nominations, great reviews and continuous radio airplay in Australia, Europe, Japan, USA and Latin America. While a teenager, Juliana was introduced to the founders of Bossa Nova by prize-winning music historian and journalist Ruy Castro who also dubbed her the ‘Bossa Nova Baby.’ This direct exposure to the Bossa Nova masters inspired her to become a professional singer and song-writer. Mike Bevan has performed jazz, blues and Brazilian music locally, nationally and internationally in Brazil, Japan, Korea and the US. Mike tours the country regularly and has played WOMADelaide, Bellingen Global Carnival, the Famous Spiegeltent, the Adelaide Fringe and Cabaret Festivals and the Adelaide International Guitar Festival with Doug de Vries and Yamandu Costa. He has produced two CDs with ‘Caliente’, ‘Bebé’ and ‘Menage à Guitar”; two with vocalist Charmaine Jones, ‘A Small Hotel ‘ and ‘Still’; a solo album, ‘Homage’, and ‘Never too Far Away’, a recent collaboration with his brother Andy Bevan. A red rose on the piano. A special night at the Ellington Jazz Club. Bossa Nova Baby Show Tribute to Graham Wood’s life, talent and legacy. Thank you everyone for being part of it last night. With love from all of us. This week on Wednesday 19th July, Perth lost Graham Wood, great pianist, academic, co-owner of The Ellington Jazz Club and founder of The Perth International jazz Festival. My condolences to the family, Alex, the kids… May Graham be with his beautiful mother Stella and his father… May Graham always be with us through his music and all that he has created to make a difference. Calling all bossa nova and samba aficionados. Juliana Areias – Bossa Nova Baby is back after her inspiring tour to Brazil. The Bossa Nova Baby show has been embraced by audiences across the whole of Australia, Europe and Brazil, showcasing contemporary arrangements of well loved bossa and samba standards – such as “Mas que Nada” and Jobim’s “The Girl From Ipanema” – as well as Juliana Areias’s original songs from her multi-award nominee album “Bossa Nova Baby” which has been featured on radio nationally and in Europe, Japan, the United States, New Zealand and Latin America. Juliana will share her passion and the stage with top musicians Paul Millard (sax / flute), Ben Matthew (piano), Joe Southwell (bass), Vince Pavitt (drums) and surprise guests. Get ready for a sensuous night of fun, rhythms and beautiful music not to be missed, all to celebrate the Carnival spirit of the week! Calling all bossa nova, chorinho and samba aficionados. Juliana Areias – Bossa Nova Baby is back after her inspiring tour to Brazil, the country of Carnival! Juliana Areias & Mike Bevan (Adelaide) Quartet at Fremantle Jazz (12//2) Beyond Bossa Nova Show – Unifying the “fathers” of Bossa Nova ( Antonio Carlos Jobim) and Chorinho (Pixinguinha). Juliana Areias – Bossa Nova Baby (Brazil) and Mike Bevan (Adelaide), sharing the stage with Paul Millard (sax/flute)and @Mike Boase Michael Bo’azz (drums). They will present a stunning afternoon of cool jazz, summer sambas, breezy bossa and captivating choros – Brazil’s most sophisticated musical genre and precursor of samba – authentically performed by Mike on a 7-stringed guitar. It will also be a great opportunity to enjoy groovy improvisations and interesting originals such as Estrela Acalanto (Star lullaby) and Garoto de Copacabana (the Boy from Copacabana) co-composed by Mike and Juliana. Juliana has performed at the Montreux Jazz Festival, Sydney Opera House, Ronnie Scott’s in London. She has been featured on ABC Radio National, receiving rave reviews and continuous airplay in Australia, Europe,Japan and Latin America. Music historian Ruy Castro has dubbed her ‘Bossa Nova Baby’. Mike Bevan has performed jazz, blues and Brazilian music locally, nationally and internationally in Brazil, Japan, Korea and the US. He has payed in WOMAdelaide, Bellingen Global Carnival Famous Spiegeltent Fringe, cabaret and international guitar festivals with Doug de Vries and Yamandu Costa. Juliana Areias – Bossa Nova Baby show in Ravensthorpe Town Hall – Regional WA (18/2). Juliana Areias – Bossa Nova Baby back to the Elligton Jazz Club – Perth (25/2). Get ready for a sensuous night of fun, rhythms and beautiful music not to be missed, all to celebrate the Latin spirit of the Carnival Month! Carlos Miguel – Music critic and judge member of the “Latin Grammy Award”. – ” A wonderful Brazilian-Australian bossa nova baby with contemporary bossa nova songs.“– Key and Chords, Belgium/Europe – Patrick Van de Wiele .